How are Strength and Permeability of Concrete Interrelated? Now-a-days durability of concrete is major concern in mix design and proportioning and permeability of concrete is a way to penetrate chemical agents and as well as physical damage. So significance of permeability has to realize clearly and proper mitigation measure is required. Strength of concrete is the most important property which is interrelated to all other properties. Here we will find relation between strength and permeability. We can easily realize that the smaller porosity will produce stronger concrete. Again amount of void in concrete defines it permeability property. So both term is interrelated through capillary porosity. So it is considered that the measures influencing strength also influence concrete permeability. Reduction in capillary voids of paste matrix obviously reduce permeability and also increase strength of concrete. Say with low water-cement ratio we can increase strength of concrete and also the permeability of concrete also reduce. 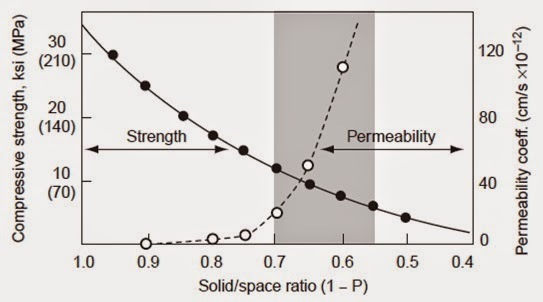 The figure shown below provides exponential relation between strength and permeability with porosity. Do you know usual porosity of cement paste and natural aggregates? The usual capillary porosity of hardened cement paste in concrete lies between (30-40) percent. In natural aggregate this value is usually 3 percent and in rare cases exceed 10 percent. In concrete production our usual interest is to make it less permeable and we will try to keep permeability of aggregate as low as possible.